The SSVC6D Dual Source 6-Pair Speaker Selector with Volume Controls is one of our most popular models because it’s the perfect fit and price for a wide range of distributed audio systems and includes features found on selectors that cost three times as much. Made of high quality metal cast construction and compact enough to fit tablet top, this versatile speaker selector connects six pairs of speakers or 12 speakers total and puts you in control of which zone to play and at what volume level. 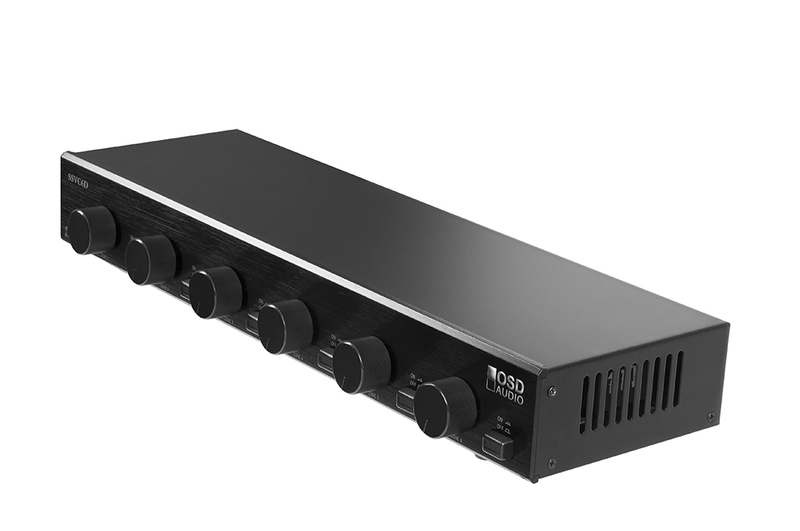 Compatible with all high-power amps up to 300W, the front-mounted master A/B switch allows you to toggle between two audio sources; for instance, switch from music streamed from your tablet or receiver with just a push of a button. This durable 6-zone speaker selector will accommodate many distributed audio systems and is limited only by your imagination. Control your outdoor rock speakers and patio system with outputs 1 and 2, dining room and kitchen speakers with outputs 3 and 4, etc., to create a professional-level whole house system. The SSVC6D is also well suited for commercial applications such as restaurants where the bar area may have higher volumes than the dining rooms and restrooms. To help protect expensive audio equipment, this 6-zone high-power speaker selector includes impedance-matching frequency protection circuitry that reduces subsonic signals so you can safely drive multiple pairs of speakers without going below the amp’s impedance ratings which can cause it to overheat or shut down. 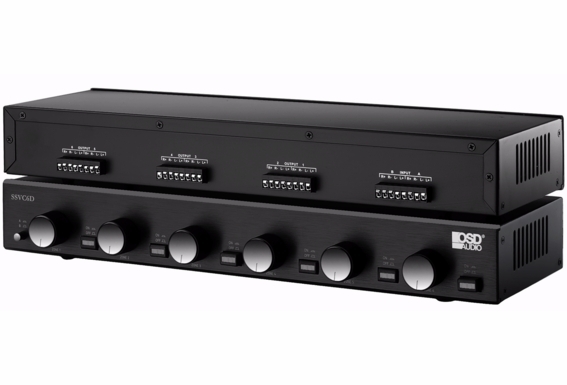 Connecting 12 speakers is a tedious and frustrating chore which is why the SSVC6D includes removable input and output connectors that accept up to 14-gauge speaker cable. The heavy-duty connectors unplug from the back so you can strip and insert the wires systematically without confusion of what speaker wire is going to what zone. For added convenience, the individual on/off buttons are slotted so you can label each of the listening zones. Dimension 16 3/4" x 10 1/4" x 2 1/2"
I currently have 6 pairs of speakers powered by a Yamaha R-8 receiver. One pair of speakers is hooked to the receiver's B terminals and the other 5 pairs are hooked to the A terminals via a speaker selector box (no individual volume controls). I would like to add a Yamaha R-N803 receiver to also power these speakers. Would the SSVC6 be a good choice for this scenario? Will this 6 channel selector work with my old pioneer VSX-453 receiver? I want to run a few pairs of speakers in other rooms. I have an Onkyo TX-80 receiver. I use it with a simple speaker selector to output to any of 6 pairs of hard wired speakers of different makes/sizes & impedences (deck/kitchen/porch/living room and play room), 5 total pairs. There are no selector volume controls which is a balancing problem when more than one set of speakers is chosen. We do not typically crank up the volume. I am looking to purchase the OSD SSVC6D for the volume adjustment capability. Would I need anything more to make this setup work? Am I able to use this volume control with 4 ohm speakers? If so, does my receiver need to be able to handle a 4 ohm load? Or will it balance the load from the speakers connected to it and present the amp with an 8 ohm load? And can I mix & match 4 ohm & 8 ohm speakers, or do they all need to be the same? AM I able to use this with a Crown XLi 1500 (330 watts into 8 ohm) to drive 6 pairs of 8 ohm bookshelf speakers? How does the ssvc6 differ from the older version svl6? I have an Onkyo Tx-rz610. Will the SSVC6D dual source work with this receiver? Does this product keep the left and right channels grounds separated / on different paths? I see that as a requirement mentioned with SONOS amps. I have two receivers,one a sony home theather. the other a Yamaha receiver. I would like to use my front speckers on both receivers . is there a switch for this. I have polk tower speckers. I would like use them for both. 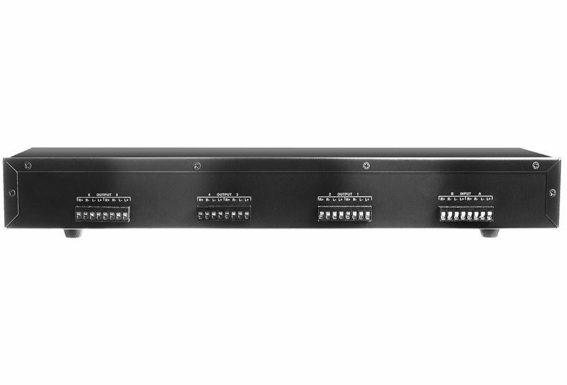 I just purchased two of these switches as I'm building my whole house audio system now. Does this switch use a transformer or resistors to match impedance? My audio reciever is in room upstairs which control all 8 zones with hard wired connections. Is there a way to remote control this unit? Does this unit require ventilation? I need to use it outside. Can it be mounted in a watertight and airtight container? It says free shipping. does that include Canada? How to set jumpers? I have the OSD-SSVC6D Stereo Speaker Selector and I'm not sure how to set the jumpers. I have 7 pair of 8ohm speakers, 1 pair each for zones 1-5 and 2 pair 8ohm wired in parallel (4 ohm load). My amp is 110 watts per channel and can handle an 8-16 ohm load. Should jumpers be set to 1x, 2x, 4x, or 8x? Do I set all the same or set the channel with 4 ohm load differently? My family room was custom-wired for 2 pair of indoor and 1 pair of outdoor/patio speakers to play off of an indoor receiver. I've recently added another pair of outdoor speakers and will be adding an outdoor receiver to be its source. So from the patio standpoint, I have: A pair of speaker wires coming from my indoor receiver (we'll call these Speaker A). A pair of speaker wires coming from my (soon to be) outdoor receiver (for Speaker B). Thus I have 2 pairs of patio speakers (Speakers A & B). Would this SSVC6D 6, or another device you'd recommend allow me to switch Speaker A's audio source between the indoor and outdoor receivers? It would be nice to listen to the outdoor receiver thru all (4) patio speakers, yet not lose the ability to switch over to my indoor receiver despite it only coming from 1 pair of speakers (Speaker A) at the touch of a button. Hope I didn't confuse you. I have a Yamaha RX-710 AV Receiver. Can this control 4- pair of speaker and center speaker. How do I wire to receiver? i just purchased the SSV6 speaker selector from OSD and cannot get it to work with a Pioneer VSX 42. have looked up the input from the B speakers into the SSV6 and cannot get any sound. please advise. Speaker selectors are only intended to be run with high-current amplifiers such as our AMP300. Standard receivers are usually only built to run at 8ohms. When you have that many speakers running off the same load, the impedance drops down below 8ohms and can be unstable for receivers not rated to handle lower impedances. I am planning on running 4 sets of speakers through an Onkyo TX 8050 receiver for background music in a medical office. Is the SSVC4 well suited for volume control of these 4 pair and is the receiver a good fit? I plan on playing internet radio, sirius radio and from an I-pod. Hello Steve, The SSVC4 is built to run 4 separate pairs of speakers and give you on/off control plus volume control on each zone. Typically it's recommended to run with a high-current amplifier such as our AMP200, but in some cases can safely run off a receiver. It would help if your receiver can handle lower than 8ohm loads only. If it can handle a 4ohm load, that would be good. Looking at purchasing a SONOS Connect AMP and using this 6 pair speaker selector to control 5 pair of (a total of 10 individually) speakers. Looking at either the 6.5" ICE640's or MK650's - 3 pairs of either or, ICE600WRS - 1 pair, and Yamaha NS-AW150 - 1 pair. Will this setup work? I guess I'm most concerned with the speakers being driven properly from the SONOS through this speaker selector. Help? Thanks in advance. P.S. If you can also shed insight into the 6.5" speakers that would also be much appreciated! Hi Harold, Are those the specs for your amp? If so, it looks like you'd have far too many watts at a 2ohm load and 4ohm load. Unfortunately 300-400 watts total would be the max any of our higher-end speaker selectors can handle, so it may not be a good idea to run a selector with that amp. Usually our customers run our AMP200 and AMP300 with multi-zone audio. I have 6 pairs of speakers I would like to hook up to one reciver . Will this unit be able to do that? And what would be a good reciver to do this? Hello Patrick, Yes - you would just need a powerful enough amp to run this amount of speakers. Use our AMP300. In fact, I would recommend running two smaller speaker selectors rather than one 6-zone, as our AMP300 has 2 zones, each with 150 watts. Thus, you can run an SSVC4 on zone A of the amp, and an SSVC2 on zone B of the amp, for a total of 6 zones (pairs) but twice as much power as you would get running all on an SSVC6 on one zone of the amp. Can i use the amp120 for this selector. Im just going to use it to here ambient music in a spa. If I change a zone from a to b it only stay with the a source. do I alway need to leave source b on? I'm planning on using this speaker selector to power 5 zones of stereo speakers (all are 8 ohms) - total 10 speakers. They will be powered by zone 2 of Yamaha RX-A2010 (140W per channel). Will my receiver handle it? I'm planning only using it for background listening.... Thank you. I have 6 zones. One is the surround I intend to connect directly to the receiver. The other five will be powered by your amp 200. My existing five zones of speakers are wired as mono back to the av cabinet. If I output from the amp 200 in bridge mode to the ssvc6 300. (A). Will it work. And b if so should I bridge out from the ssvc6 from each zone to the speakers. Or just wire out from one channel of each zone to the speakers? i purchased this to use with a sherwood RX-4105 amplifier which runs into the speaker selector and then out to 4 sets of Polk Audio OWM3 and 1 polk audio Atrium 4 speakers. All speakers are 8 ohm, one per channel. This is used in a resturant so the stereo runs from about 3pm to about 1pm. So there are a total of 5 zones hooked up right now (1 empty) but the amplifier will shut off now and then. (What I assume is overheating.) The amp runs at 100w per channel according to the manual, is that enough for all these speakers? Do you have any other suggestions? I have an Onkyo TX-NR708 receiver with 5.1 Polk Soundbar on Zone 1. My house is pre-wired with 5 speaker zones (measured impedance is 6 ohms). Can I connect this selector directly to Zone 2, and randomly control which zones (1 or many) zones are one, and the volume at each? We have 22 speakers (11 sets) that put our 60 watts of power each or a total of 1320 watts. I see that this unit can handle 1800total watts. I know that input/output impedance can be a factor, but can we DOUBLE up the amount of speakers we put on each of the six audio sources? In other words, can this accommodate 12 sets of speakers (doubled up) instead of just six? Thank you! I need a speaker selection box, for six pairs, with impedance protection that handles banana plugs. Does OSD make anything? Do you still carry Dual Input of this unit? Will this work with only 4 pairs of speakers now until I upgrade to 6 pairs later, or will it have issues running like that? I have a 7.1 theater system. The receiver's power output is 20 Hz - 20 kHz/THD=0.08%: Theater front has a center, a L&R and 2 subwoofers. A surround L&R is in back of room and 2 surrounds in L&R ceiling (8 ohms, 110 Watts/Channel and 6 ohms, 140 Watts/Channel). Aside from the theater room, there are 3 additional sets of speakers (weight room, bar area and outdoors). I am looking for a speaker selector which will handle this system. Obviously, the SSVC6-D300 can accommodate the 3 zones but I have other questions. 1. Will the SSVC6 - D300 handle my receiver? 2. If not, Is there another speaker selector more appropriate for my system? I know very little about wireless speakers. Is it possible to connect outdoor wireless speakers to the SSVC6? My Receiver is the RX-V3800 I have a main Theatre room with a Sub, Center, Front and back right and left. Outside two pairs or spekers wired as one. Hi Scott, Your amplifier has a speaker level output for your second zone, which I am assuming you have connected to your two pairs of outdoor speakers. You also have the option of connecting an external amp as well to drive the two outside pairs. Although I’m a little unclear on the end goal, you can use the SSVC6 to drive your current external outdoor speakers connecting a pair to each zone. That would leave you with four open zones to expand your system. Note this has six self-contained volume controls that you can adjust at the box. We offer other alternatives where we separate the speaker selector and volume controls so you can locate the volume controls in the actual zone. We do have outdoor volume controls for your application as well. If nothing else, you should probably have your two outdoor speakers connected to a impedance matching volume control. Right now based upon your information if the two speakers are connected in parallel, you are presenting a 4-ohm load to the amplifier which is making it work harder than it is intended to do. Check out our OVC100 Outdoor impedance matching volume control. I noticed this is 300W, but could it work with a 150W reciever? I was planning on upgrading to a more powerful reciever, but would like to use it for now with the 150W reciever. Also could this work with 12 ohms impedance speakers. (I have 2 sets of 3 - 4 ohms speakers wired in series so it could work on a regular house reciever) Would this be a problem? ?